Here you can find long and short essay on Indian village, their life in a village, some useful sentences for school student of class 1, 2, 3, 4, 5, 6, 7. 9 and 10th. I hope the following essay about village life will be helpful. People who live in cities do not know what living in a village means. My village is one of those which are blessed by God with a very fertile soil, we the villagers are very hard working. When I recollect my childhood days, I remember how we lived in a village without taps and without electricity. Yet we never envied the city people. I still remember how early in the morning, I used to go to the village well with my mother to have a bath. Many village women used to gather together and reach the well before sunrise. I don’t know what they used to talk about, but the way my mother laughed with other women showed that they were very happy. They had no worries, and not many wants. Today, with electricity and taps, my village looks more charming. Though there is a pump at our house, I prefer going to the well. Early in the morning, when most others are sleeping, I enjoy walking through green corn fields. The houses in my village are made of mud. Most of the houses are built in clusters. These clusters sometimes standing in the middle of green fields present an artistic colour combination of green and brown. The women clean their houses every week. People from town may think that we must be measurable in the summers. We have no fans, no AC. Even when we have them, we hardly use them. Bust most of our houses are built near shady neem trees. It makes our houses cool. Even otherwise mud houses are much cooler than brick houses. We had no market in our village. Only once a week people from neighbouring villages come to sell things to us. As we have few wants, we get most of the things we need from that weekly market. Now as I have grown up, I may have to go to a city for studies or for jobs. The idea that I shall be away from my village for some time, makes me sad. I am a true son of the soil. Nearly 70% of our population lives in Indian villages. Most of them are agriculturists. They live on land. Some run shops, few of them are black-smiths, carpenters, potters and other work as labourer. Life in Indian village is simple. It is full of rest and peace. There is no hustle and bustle, and no rush of traffic like cities. 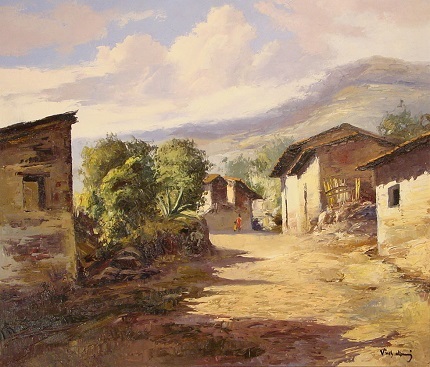 A villager lives close to the nature and enjoy the fresh air and cool breeze. They take fresh vegetables and fruits, drinks cow’s and buffalo’s pure milk, eat simple, unadulterated and nourishing food. He wears coarse clothes and lives in lives in Kachacha houses where they keeps thoroughly clean. An Indian villager has to work hard. His women-folk share a part of his out-doors work. Villagers are earning their living by the sweet of their brow. They are generally healthier and stronger than city people. Most of the villages have Panchayat houses where villagers assemble to settle their petty dispute. Now village Panchayat houses are now well-equipped with modern amenities, much better condition than earlier. Almost every village has a well. Now an old well is discarded in favour of tube well. Villagers have ponds where they bath, wash their clothes, and make their cattle drink water. There were generally single primary teacher, but now the condition has improved a lot in villages. The people have now begun to send their children to schools, but most of the villagers are backwards. Being ignorant they superstitious and cast-ridden. Now every well populated village has a dispensary where villagers can get free treatment. Uncertainty of rain has made the Indian villagers a fatalist. Sometimes drought and floods ruins his crops and the poor fellow feels miserable. They live in the world of his own, unaffected the rapid changes going in the world outside. But the government are now taking up all possible steps to improve the condition of villagers. They are taking slow but sure strides towards progress. They are giving old customs and away of farming. First class seed and chemical manure are being provided by the Rural Development department. Tractors and other agricultural machines are being brought into use. Most of the villages are now electrified. Irrigational facilities are being provided by the Government. With the prices of cereals and other agriculture produce going up, the villagers have grown prosperous. There is police station in the big villages, but in the small villages, the chowkidar performs the duty of policeman. There are no cinema houses, no theaters and no so called entertaining clubs in villages. The villagers generally amuse themselves by playing at cards, holding Kabaddi and wrestling matches and in their free time at night by gossiping, smoking and listening to radio news etc. in the company of their village brethren.